The convention bounce is one of the more vexing problems in presidential forecasting. That is particularly so this year. Both conventions are being held late — the Democratic convention dates are the latest since at least 1952 for the challenging party, and the Republicans’ are the latest since at least 1952 for the incumbent party. Moreover, the conventions are being held right on top of one another, with just one week of separation between them. 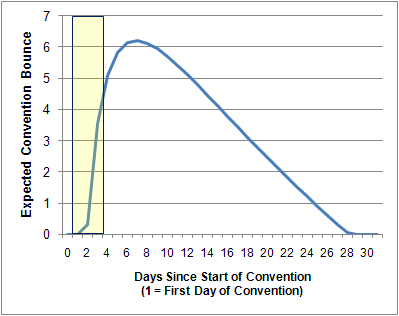 Most years, there is at least a three- or four-week gap between the opening dates of the conventions. That gap was as small as 14 days in 1996 and 15 days in 2000, but it has never been so small as the seven days that we have this year. But the convention bounce is also not something that can simply be ignored. If we looked at the polls from the weekend immediately following the Democratic convention, for instance, and did not adjust them in any way, that might give us an inflated idea about Barack Obama’s chances of occupying the White House. What I have done, then, is to boot up my database of national polls, which covers all elections since 1952. I looked at the average margin for all polls conducted within 150 days of the election; for instance, the average of all polls taken within 150 days of the election in 2000 had George W. Bush ahead by 2.0 points. 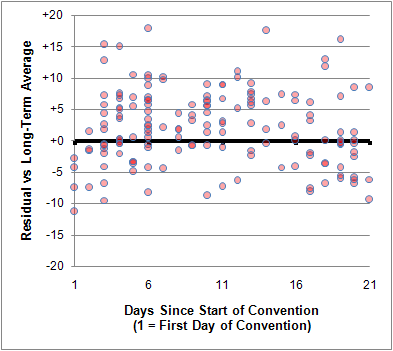 Then, I looked at to what (if any) extent the candidate was overperforming that average in the 21 days commencing from the first date of his party’s convention. For instance, if GWB polled 9 points ahead of Al Gore in a survey conducted one week from the start of the Republican convention, that would be considered evidence of a 7-point bounce — his 9-point lead in that poll less his long-term, 2-point advantage. …where ‘d’ is the number of days elapsed from the start of the convention (the first day of the convention is counted as ‘1’ rather than ‘0’). Note that I weighted recent years somewhat more heavily in coming up with this equation. The function is defined as zero where it takes on a negative value). What the chart shows is that the bounce begins to manifest itself in earnest as of about the third day of the convention. This makes a fair amount of sense intuitively. The first day of the convention, usually nothing much happens; there may not even be network coverage of the events. The second day, something does happen — the keynote speech, frequently — but it happens in prime time, after the pollsters have already closed shop for the day. So it’s on the third day when you can generally expect to see some tangible effects. From there, the bounce accelerates quickly, peaking approximately 6-7 days from the start of the convention — that is, the weekend afterward, if the convention runs from Monday through Thursday. It then dissipates in a roughly linear fashion over the next 3-4 weeks. Note that we find the average peak bounce to be about 6 points. This is highly consistent with Tom Holbrook‘s research, where he found the average bounce to be 5.9 points in conventions conducted since 1964. A 6-point convention bounce represents par. If a candidate gets a bounce larger than 6 points, that can be considered to be a good sign. If the bounce is smaller than 6 points, that can be considered to be a bad sign. Our default expectation is that Barack Obama will get a decent-sized but short-lived bounce, which will quickly be compromised by the start of the Republican convention. However, the Republicans’ bounce might not be as big as it otherwise would be, because there may still be some lingering afterglow from the Democratic convention. It might take until roughly the time of the first debate on September 26 for the convention effects to dissipate completely. The polls are going to be extremely difficult to read in the interim: we don’t quite know how these two curves are going to interact. I would say that, if Barack Obama still holds the lead in the race in the weekend following the Republican convention, that is probably a pretty good sign for him. 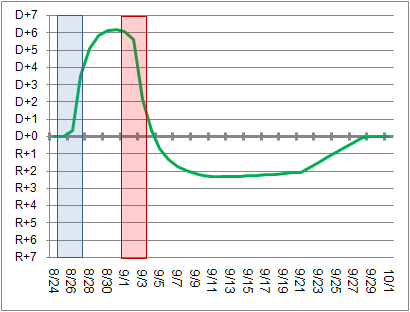 The curve you see above is also relevant to our methodology, since polls conducted in the convention bounce window will be adjusted according to it. In other words, if Barack Obama is polling at a +9 in the weekend following the Democratic convention — at which time we’d typically expect him to be experiencing about a 6-point bounce — we will treat that poll as a +3 for purposes of our forecasting. By extension, if Obama only experiences a 2-point bounce in the weekend following his convention, it will actually harm his forecast.